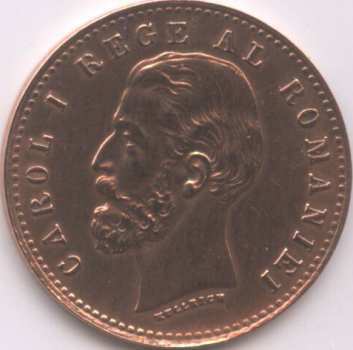 denomination "2 BANI", year 1882, Romanian coat of arms, letter B and wheat ear, the signs of Romanian mint, outer pearl circle inscription "CAROL I REGE AL ROMANIEI" meaning "KING OF ROMANIA" and CAROL I head facing left, outer pearl circle. Under the neck lies KULLRICH, the engraver's name. There are several variants of this coin, with various broken letters. 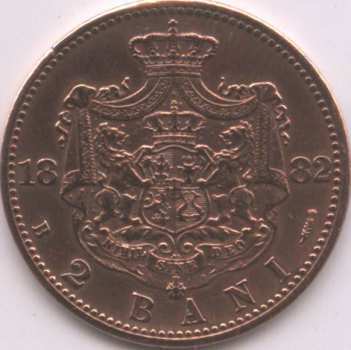 The about uncirculated 2 bani from 1882 coin pictures above are present on Romanian coins through the kind permission of Mr. Lazăr Florin.